So, Häagen-Dazs sorbet was on sale, and since they tend to make top notch stuff, I decided to give it a try (all the Hola Fruta! is gone unfortunately). I take off the lid and the carton is sealed, very nice touch! I get a spoon and dig in. Oh Man, this does not taste good at all. Instead of eating raspberries, it tastes like I'm eating the stems. Oh, I don't like this at all. Texture is ok, like frozen ice, but it tastes like those "good" fruit juices that wind up tasting like bark and not the actual fruit. I have no urge to continue on, spoons down bigtime on this one. Info: Ahhhh, that's what I figured when I looked at the ingredient list. Sorbets don't use milk, while sherbets tend to use a little bit. Good to know. On Second Scoop: Ok, going in with lowered expectations. Ok, i was a little harsh I guess, though I still don't love it. I'll probably eat it so it doesn't go to waste, but I can't imagine trying it again. What can I say, I like sweet sherbets, this sorbet's just a bit too 'natural'. I guess it kind of reminds me of one of those unsweetened jellies you can buy. I'm 12 weeks pregnant, and Haagen-dazs sorbet is saving my life right now. it's about the only thing I can eat without puking. I have peach, mango, strawberry, and raspberry in my freezer as we speak. 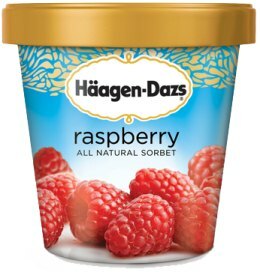 this was my like 4th haagen dazs flavor trying ever n the first of their sorbets n ive had many sorbets in my 2 decades n this sorbet is really god awful. i mean it tastes so artificial-basically like straight up corn syrup which is like the second ingredient in this after like water so ya i dont blame u at all 4 hating it haha i hated it 2. but im still gona try some of the caramel hd soon n let u know wat i think of them in this same comment box haha n try to find more graeters n bluebell.. i request more graeters n bluebell reviews on here plz haha ok thanks!